A city tour of Corfu is the ideal recreation, especially since it combines various cultural stimuli with excellent facilities offering food, coffee or ouzo. The cultures that crossed their paths here have left their indelible mark on this town ,where locals nowadays live, work and enjoy . Tennis courts, cricket and golf, horse riding, sailing and diving schools, organized hiking and cycling, birds watching , whatever a visitor feels like doing, he can do here! Traditional taverns, luxurious restaurants, delicasy- and fishtaverns , inspired by the long culinary tradition of Corfu, as well as the international cuisine, are located in the city and the suburbs, waiting to tempt their guests with culinary delights. The nightlife in clubs, bars and “ellinadika” (clubs that play greek music) stresses the so-called Greek revelry. The Municipal "Art Cafe" is located in the garden of the Palace. It offers a magnificent view and the cool shade of a rare African tree. The interior of the cafe is decorated with furniture of the former royal family and houses the Municipal Gallerie, where painting and photography exhibitions by contemporary Corfiot artists regularly take place. “Liston”, on the west side of the Espianada, strongly reminiscent of the Rue de Rivoli in Paris, is the classic meeting point. One can sit in one of the well known cafes, read a newspaper from the nearby kiosks,drink coffee or ouzo, watch world cricket matches on Saturday afternoons or philarmonics, cheer leaders and religious processions on others. “Mouragia” is one of the most beautiful places of the old town and the first to be seen once the ferry boat passes the Old fortress. Arseniou Street starts from the Palace and follows the coast walls down to the old port. Under the road surface and after the Palace, is the Venetian gate of Ag. Nikolaos at the location 'Faliraki'. There are the former"Baths of Alekos" and the building complex of the Ionic Cultural Centre. Part of the complex is the old church of Agios Nikolaos of the Baths. This point offers a unique view of the Old Fortress and the island of Vido. Mantouki,opposite the New Port, is one of the most beautiful old and picturesque suburbs of the city. A stroll in its inner street will reveal the old houses and factories, traditional shops, good restaurants and grill rooms..
Garitsa and Anemomilos are two other historical suburbs bearing the traditional popular features of a Corfiot neighborhood, where taverns and grill houses set their tables under the trees for “souvlaki” and cold beer. A ride to Kanoni will reward the visitor with the breathtaking view of the church of Vlacherna and the worldwide famous “Pontikonisi”,a landmark of Corfu. 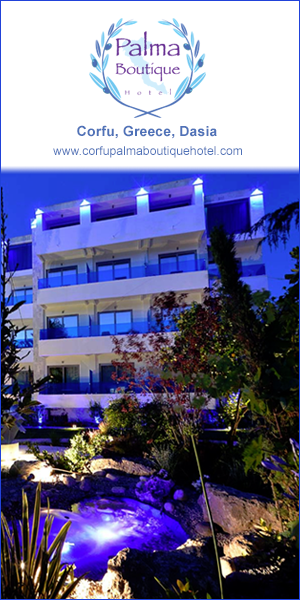 The nightlife of Corfu starts in the classic cafes at Liston with ouzo, ginger beer and ice cream, and goes on in Guildford Street and the City Hall Square, in an exquisite environment where stylish restaurants will take you back in time. Scattered around the city's alleys are taverns, restaurants with genuine local cuisine and authentic Italian restaurants – a cuisine considered akin to the Corfiot one. Surprises await you in both Fortresses, Old and New, like the two cafes serving drinks to the sounds of discreet music in the evening . The night is not complete without “a series of”: in Mantouki ,opposite the Port Customs, is a series of bars in the business center. Thus a shipyard and fishing boats on one side, bars and clubs on the other. Music for all tastes: Rock, Soul, Trans, Underground and Greek music are mixed in bars with gardens, balconies, palm trees and a lot of people. Here the party lasts until late. Whoever comes here, is hard to leave before dawn.